So you know when people ask you if you could only have one make-up item that you live with what would it be? Well I usually say eyeliner or mascara, and although that is still some make-up items that I wouldn't want to live without, lipstick is becoming something that I seriously can't live without. I love that lip sticks can give you that pop and make your look so different, and so much better. I've said it before how much I love lipstick but my current obsession is matte lipsticks! I love how matte lip colors look on someone. I think its so classy and pretty. Something that stood out a lot in Spring/Summer fashion shows this year was the bold lip color, but they were matte lip colors. I really am not a huge fan of the super shiny glossy look for myself, so now that matte lip colors are in I am so happy. These four lipsticks are some that I have and love, so I would highly recommend all four. I've talked about my Bobbi Brown True Pink lipstick and I love it, but these other three are so fun and they will definitely give you that bold, matte lip color. 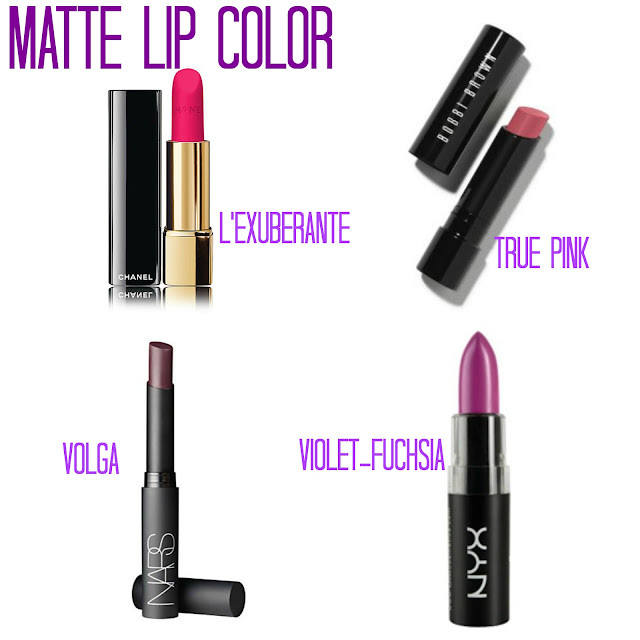 If you aren't wanting to spend a whole lot on lipsticks then NYX is where its at for you! For only six dollars you get a great lipstick and they have tons of different colors to choose from. I love that first lip color. I used to wear only lip glosses but I wear lip stick a lot more now. Gotta have it!! That Volga color is SO pretty!! That Chanel color is amazing! i agree! lipstick can really make a look! love matte lips! so pretty! Love the color by Chanel!